This chapter describes use of Natural Computing for optimization in the domain of Steganography. Steganography is an art of concealing information in any media. Internet has made digital content popular and very widely used media. Digital contents shared over Internet are text, audio, images and video streams. Video steganography is hiding secret information in video. It is gaining increasing significance as video streams are transmitted frequently over social media sites like Facebook and YouTube. The first part of the chapter introduces steganography and highlights video steganography as an optimization problem. 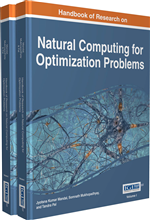 Further in the chapter natural computing is discussed and Particle Swarm Optimization (PSO) a popular natural computing tool is elaborated in details. Experimental results are presented to check the efficacy of the method. Information hiding techniques are receiving much attention in today’s digital world. Though hidden exchange of information has been an important paradigm since old times. In this age of information and communication technology (ICT) with the wide spread use of Internet it has gain much importance. An important sub field of information hiding is steganography. Steganography (Katzenbeisser & Petitcolas, 2002) is the technique of hiding secret information in host media, such that the very existence of information is concealed. Steganography literally means “covered writing” and it has a strong existence in ancient history as well. Historical existence of covered writing can be seen as late as 5th century BC, where Histaiacuss shaved the head of his slave and tattooed a secret message. He later sent the slave with the concealed message after his grew long (Johnson & Jajodia, 1998). More such existence of covered writing in ancient history exists in literature. Thus “covered writing” is writing in a host media such that it is concealed inside it. Further the technique used for concealing should be such that its existence is hidden. With the invention of computer and digital signal processing (DSP) the host media also became digital. In this digital realm the cover media were contemplated as text and image. The first existence of digital steganography can be seen in (Kurak & McHugh, 1992). They proposed image downgrading which has traces of image steganography. A host of digital steganography techniques exists in literature ranging from spatial domain to transform domain. In spatial domain the information is concealed in bits of the host image. Hiding in least significant bit (LSB) is by far the most popular method in image steganography in spatial domain. However spatial domain techniques have weak resistance to attacks. This motivated the researchers to exploit frequency domain techniques. Further advent of Internet and huge popularity of social network and online entertainment sites, video and audio steganography became a challenging proposition for research fraternity. In comparison to image steganography, video steganography is more exigent as digital video is often compressed both spatially using transforms and temporally using motion compensation. Video, or moving image in general, is created from a sequence of still images called frames (Ze-Nian et. al., 2005). Another advantage of video as host media is size of video is much larger and thus it gives the possibility to embed and send large amount of data. Nevertheless modification in a video file is more difficult to be detected by human visual system (HVS). In literature survey it is seen that video steganography techniques can be classified in the lines of image of steganography as spatial domain and transform domain techniques. Where the existing image steganography techniques are extended or modified in video domain. A better way of categorization using the features of the host media (video) can be, compressed video techniques and raw video steganography techniques (Sadek, Khalifa & Mostafa, 2014). Diagram depicting the categorization of different video steganography methods is given in Figure 1.